Sunken cheeks and a weak chin can affect the overall balance and proportions of your face. It is important to consider all aspects of the facial skeleton to achieve facial harmony and therefore an aesthetically attractive facial appearance. Our surgeons can help you achieve this. If you have a weak or receding chin and would like a stronger jaw line or sunken cheeks and would like more prominent defined cheeks then we may be able to help you achieve this look. Your surgeon will give you an honest opinion as to what is the most suitable procedure for you. Q. How is cheek augmentation performed ? Both these procedures have their pros and cons and Mr Sojitra will explain this to you during your unhurried consultation. There is no visible external scarring for cheek implants and for fat grafting there is a very small scar hidden inside your tummy button. Q. 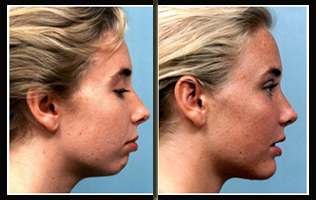 How is chin augmentation performed ? There is no visible external scarring for the sliding genioplasty and chin implants. For the fat grafting there is a very small scar hidden inside your tummy button. Your surgeon may recommend this procedure instead of or in addition to nose reshaping (rhinoplasty). It is important to avoid medications, if possible, such as aspirin and non-steroidal anti-inflammatories (NSAIDs) e.g Ibuprofen (Nurofen), Sodium Diclofenac (Voltarol) for 1 week before surgery. These tablets may increase bleeding during and after surgery. It is advisable to stop smoking 2 weeks before and after surgery from both a wound healing and an anaesthetic perspective. You will be admitted to hospital on the morning of surgery the surgical plan again will be discussed with you and our surgeon will make some marks on your skin with pen. You will be required to have a general anaesthetic. The operation will take approximately 1 - 2 hours. Your surgeon will inject local anaesthetic and adrenaline when you are asleep. This helps reduce bleeding during your operation as well as reducing pain and improving your post operative comfort. Our surgeons always puts your comfort first. All the stitches used will be dissolving in order to maximise comfort for you and they will be inside your mouth and hidden inside your tummy button (for fat grafting technique). It is best you take it easy and stay in hospital overnight. You will need to have a friend or family member to drive you to and from the hospital and to look after you for the first 24-48 hours following surgery. You will experience some degree of bruising, swelling, and discomfort around your cheek and chin all of which improve by the day. The bruising should subside after 1 week. You may put make-up on after a few days if you wish. Our consultant anaesthetist will prescribe you adequate medication to take home to alleviate any discomfort you may experience. You are encouraged to rest the first night in hospital. It is important not to sleep and put pressure on your cheeks or chin. It is vital you maintain good oral hygiene with regular mouthwashes and teeth brushing. Depending on your type of work, you may return to work between 7-14 days after your procedure. No heavy lifting, straining or strenuous exercise for 6 weeks. It can take a several weeks before the swelling completely subsides and the final result seen. The stitches will dissolve on their own. Your surgeon will see you 7-10 days after surgery. Your surgeon will closely follow your recovery. Our patients have been very pleased with their new appearance after cheek or chin augmentation. Although the healing may take some time, you can expect the end result to be worth the wait. Even though the aging process continues; the changes are long lasting and patients are usually happy with their appearance for many years. Some patients may find that they want to make additional improvements at a later time. 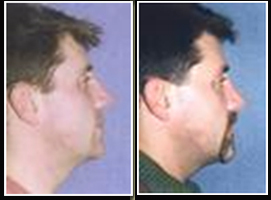 Chin and cheek augmentation can be combined with face lift for optimal results. Q. Safety and potential complications ? Scars : - Scarring on the whole is not problematic. It is hidden inside the mouth and if fat grafting is carried out then a small scar within the tummy button. Bleeding: - Rarely, small blood vessels can open up after surgery. If this occurs then the blood collection may need to be washed out. Infection: - This is not common. If it occurs the implants may need to be removed if the infection does not settle. Antibiotics by tablet are given for all patients for 1 week Numbness or altered sensation of the lower lip or cheek Numbness of the cheek or lower lip is a well recognised complication. Usually, it is temporary but may be permanent. Implant migration and extrusion : - Cheek and chin implants can sometimes move within their pocket and occasionally come out (extrude). This may require a further operation. Damage to roots of the teeth : - During genioplasty there is a small risk of damage to the roots of the teeth nearby.